Is a unique opportunity to become another mob right in the game. You can be anything, such as a conventional dog or a huge fire-breathing dragon. You will need to install a Morph mod 1.7.10 and begin to reincarnate in other characters. You will need to kill the mob and put on his jacket. Thus you will be able to scare any friends on game servers Minecraft 1.7.10. Morphing Mod for MCPE 0.10.5The mod adds a special wand, with which you can turn into a mob. Morph Victim mod for Minecraft Pocket Edition 0.10.4With this mod, you can quite easily turn into any mob, who stumble. It takes a bit of time, so you have to kill the mob to become them. 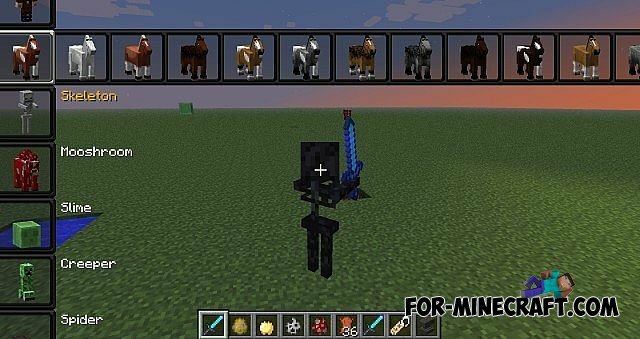 ASSEMBLY mods BY JAMMIN FOR MINECRAFT POCKET EDITION 0.9.5ASSEMBLY mods BY JAMMIN FOR MINECRAFT PE 0.9.5 - this is a great assembly with mods for Minecraft PE 0.9.5 .